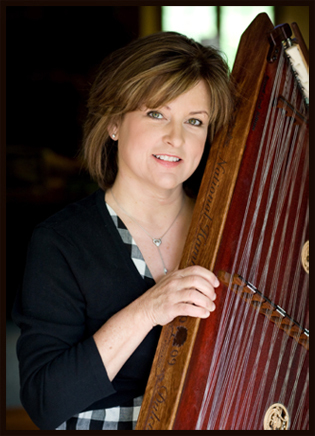 Lisa remembers the first time she heard a hammer dulcimer being played and was immediately drawn to the haunting and beautiful sounds emanating from the instrument. It also looked so fun to be drumming on strings! Lisa, a native of Houston, Texas, grew up studying classical music on the piano and was always encouraged by her father to follow her passion for music. She also considers herself geographically blessed because of the three local dulcimer players in Chattanooga TN who have been her instructors and mentors. Back to the first time she heard a dulcimer being played it was by none other than Dan Landrum. To her ears, his playing sounded otherworldly! After hearing his music, she was inspired to learn to play that instrument and purchased a small dulcimer and did not even buy a proper stand for it. Dan never said a word about the goofy setup. Eventually after hearing his new Jerry Read Smith dulcimer every week during her lesson, she purchased a used one made by this luthier. The other teacher that she credits with influencing her style is the unbelievably talented and creative Christie Burns. That has been one of the best learning experiences to be able to play out in public with someone of her caliber. Lisa is currently studying with 2007 National Champion Stephen Humphries. She feels very blessed to be performing publicly with an instrument she took up as a hobby. In 2009 Lisa decided to enter some contests for the dulcimer. In April of that year she entered and won the Southern Regional Dulcimer Championship. Encouraged by that experience she entered the National Hammered Dulcimer contest held in Winfield Kansas and won first place in September of 2009.